Cuvier was born on August 23, 1769, in Montbéliard, France. He studied comparative anatomy at the University of Stuttgart, Germany, and returned to France to tutor children in the northern coastal province of Normandy. His employer had a good library and the nearby beaches were strewn with marine invertebrates that he studied in his spare time. He sent his observations to Étienne Geoffroy Sain t­Hilaire, a zoologist at the Museum of Natural History in Paris, who hired him in 1795 to teach at the museum. In 1800, he joined the faculty of the Collège de France, also in Paris. Cuvier was a popular lecturer and became an authority on animal anatomy, physiology, and classification. He introduced the idea that an animal’s anatomy is determined by its environment, disagreeing with Saint ­Hilaire, who believed that an animal’s anatomy requires it to adopt a particular lifestyle. Cuvier contended that animals of past ages differed widely from those currently alive. He reconstructed two skeletons of major extinct plant­ eating animals from fragments found in a local quarry, and he was first to identify the bird­like dinosaur called the pterodactyl. Fossil excavations led Cuvier to ponder geology. He believed that Earth’s life span was short (tens of thousands of years) and was therefore impressed by the immense geological changes that had occurred. He revitalized the catastrophe theory, which states that a series of sudden, massive geological events, such as floods and land upheavals, had both extinguished entire species and sculpted the surface of the planet. Most of Cuvier’s contemporaries—including Saint­ Hilaire and Jean Baptist Lamarck, who developed an early theory of evolution—believed that animal species are organized in a hierarchical series from the simplest to the most advanced (humans). Cuvier suggested instead that animals be classified non­linearly into four groups, based on four distinct body plans: vertebrates, articulates (e.g., insects, crabs), radiates (e.g., snails, clams, oysters), and mollusks (e.g., corals, anemones). In 1830 Cuvier and Saint ­Hilaire publicly debated the amount of anatomical uniformity among animals. Cuvier argued that the four body plans represent distinct animal types, while his opponent countered that all animals belong to one anatomical type. Cuvier also argued that the function of organs, not just structural resemblances, be considered in classification. Their disagreement sprung from the lack of a satisfactory explanation for the similarities and differences among species, a problem that would be solved in 1859 with CHARLES DARWIN’S theory of natural selection. Cuvier died in Paris on May 13, 1832. Cuvier’s achievements mark the transition from pre­ to post­ evolutionary thought. Though many of his theories were shown to be incorrect, he helped lay the foundations of modern comparative anatomy and paleontology (the study of prehistoric life forms through examination and analysis of fossilized remains) by focusing on the relationship between structure and function and by recognizing that many fossil animals were very different from other species. 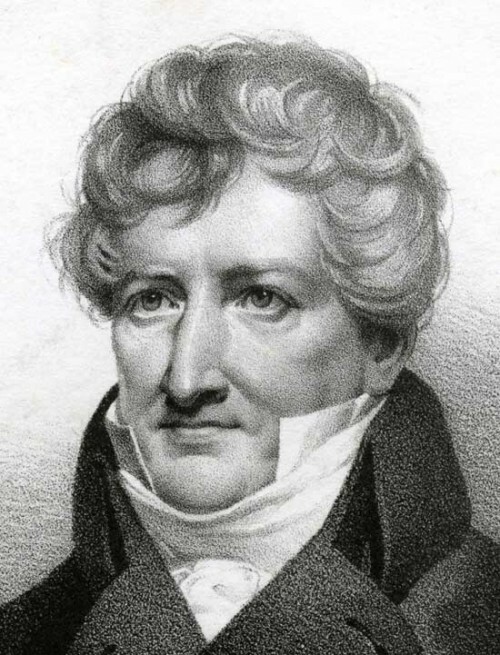 Maintaining that species were created independently of each other and were immutable, Cuvier differed from other prominent biologists of his time. Saint­Hilaire believed in evolution, as did Lamarck, who in 1809 published a theory positing that species evolve through the inheritance of acquired characteristics. This idea dominated evolutionary theory until Darwin’s theory of natural selection took hold in the late nineteenth century. Natural selection posits that certain individuals in a population have characteristics that give them reproductive advantages over other individuals, allowing the slow accumulation of those favorable characteristics and the eventual transformation of the population into a new species. Cuvier’s four ­type classification system dislodged the idea of a linear progression of animals from simple to advanced, and it dominated zoological doctrine until the theory of evolution was widely accepted. Evolutionary relationships explained the similarities and differences among animals and indicated new categories of classification. Cuvier’s talent for the reconstruction of animals from limited fossil fragments provided a basis for the specialty of paleontology. He worked primarily with the fossils of reptiles and mammals, exhibiting interpretive powers that surprised his colleagues and adding extensively to the vertebrate collection of the Museum of Natural History in Paris.